When Thulasiram enrolled in the UpGrad Data Analytics program, in its first cohort, he was not very different for us, from the rest of our students in this. While we still do not and should not treat learners differently, being in the business of education – we definitely see this particular student in a different light. His sheer resilience and passion for learning shaped his success story at UpGrad. Born in the small town of Chittoor, Andhra Pradesh, Thulasiram does not remember much of his childhood given that he enlisted in the Navy at a very young age of about 15 years. Right out of 10th standard, he trained for four years, acquiring a diploma in mechanical engineering. Thulasiram came from humble means. His father was the manager of a small general store and his mother a housewife. It’s difficult to dream big when leading a sheltered life with not many avenues for exposure to unconventional and exciting opportunities. But you can’t take learning out of the learner. At 35 years of age, Thulasiram has been in the navy for 19 years. Presently, he is an instructor at the Naval Institute of Aeronautical Technology. “I am from the navy and a lot of people don’t know that there is an aviation wing too. So, it’s like a dream; when you are a small child, you never dream of touching an aircraft, let alone maintaining it. I am very proud of doing this,” says Thulasiram on taking the initiative to upskill himself and becoming a naval-aeronautics instructor. When the system doesn’t push you, you have to take the initiative yourself. Thulasiram imbibed this attitude. He went on to enroll in an MBA program and believes that the program drastically helped improve his communication skills and plan his work better. Like most of us, Thulasiram began hearing about the hugely popular and rapidly growing domain of data analytics all around him. Already equipped with the DNA of an avid learner and keen to pick up yet another skill, Thulasiram began researching the subject. He soon realised that this was going to be a task more rigorous and challenging than any he had faced so far. It seemed you had to be a computer God, equipped with analytical, mathematical, statistical and programming skills as prerequisites – a list that could deter even the most motivated individuals. If it is easy, everybody will do it. So, there is no fun in doing something which everybody can do. I thought, let’s go for it. Let me push myself — challenge myself. Maybe, it will be a good challenge. Let’s go ahead and see whether I will be able to do it or not. Having made up his mind, Thulasiram got straight down to work. After some online research, he decided that UpGrad’s Data Analytics program, offered in collaboration with IIIT-Bangalore that awarded a PG Diploma on successful completion, was the way to go. The experience, he says, has been nothing short of phenomenal. It is thrilling to pick up complex concepts like machine learning, programming or statistics within a matter of three to four months – a feat he deems nearly impossible had the source or provider been one other than UpGrad. Ask him what are the top two attractions for him in this program and, surprising us, he says deadlines! Deadlines and assignments. He feels that deadlines add the right amount of pressure he needs to push himself forward and manage time well. As far as assignments are concerned, Thulasiram’s views resonate with our own – that real-life case studies and application-based learning goes a long way. Working on such cases and seeing results is far superior to only theoretical learning. He adds, “flexibility is required because mostly only working professionals will be opting for this course. You can’t say that today you are free, because tomorrow some project may be landing in your hands. So, if there is no flexibility, it will be very difficult. With flexibility, we can plan things and maybe accordingly adjust work and family and studies,” giving the UpGrad mode of learning, yet another thumbs-up. Amongst many other great things he had to say, Thulasiram was surprised at the number of live sessions conducted with industry professionals/mentors every week. Along with the rest of his class, he particularly liked the one conducted by Mr. Anand from Gramener. Interested only in learning, Thulasiram made this observation about the program – compared to his MBA or any other stage of life. 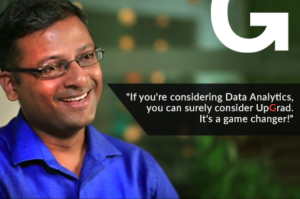 He signs off calling it a game-changer and giving a strong recommendation to UpGrad’s Data Analytics program. We are truly grateful to Thulasiram and our entire student community who give us the zeal to move forward every day, with testimonials like these, and make the learning experience more authentic, engaging and truly rewarding for each one of them. Enroll in UpGrad’s Data Analytics Program and shape your own story today!